How do I find my Valentine Coin on the blockchain? Once you receive your confirmation email with your personal Coin ID, you can now check the blockchain that your message was successfully engraved. Here is a step-by-step guide to look it up by using MyEtherWallet. 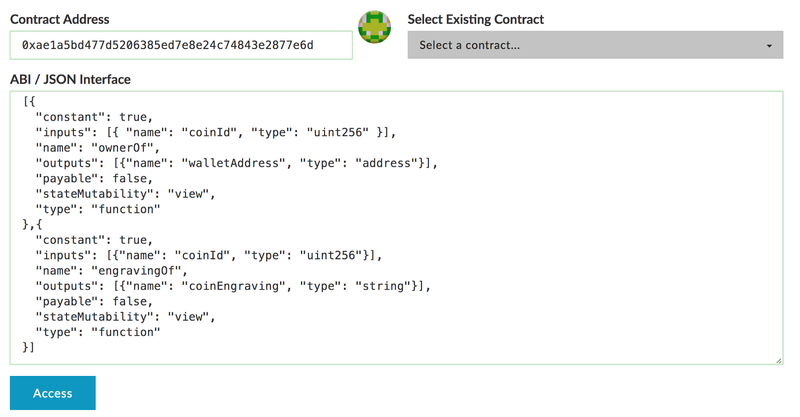 Open MyEtherWallet on the “Contracts” tab. Read through the information prompts to learn a little bit more about Ethereum and blockchain. You should now be faced with the following screen. Fill in the “Contract Address” field with ours (minus the quotes): “0xae1a5bd477d5206385ed7e8e24c74843e2877e6d”. You will see a blue notice that the address is not checksummed, which is fine. Fill in the “ABI / JSON Interface” field with the code found here. Click on the “Access” button! Click on the “Select a function” dropdown and you’ll see the two methods of our interface: “ownerOf” and “engravingOf”. Fill the “coinId” field with the Coin ID you received in your email. For our example, we’ll use the Coin ID 1. Click on “READ” next. Your message will appear before your eyes. If you want to check that your Coin was sent to your wallet, follow the above steps, but use “ownerOf” this time around. The result will show the Ethereum wallet address you supplied when you registered. Congratulations on using the Valentine Coin smart contract! ❤️ This means I can read the message for a Coin other than mine? ❤️ What if I don’t want people to read my personal message? The blockchain technology works by sharing datas. All the computers in the Ethereum blockchain network will preserve your message. If you don’t want your message to be public, don’t send it to the blockchain. ❤️ The owner of my Coin is 0x00…repeating. Why? Your Coin is still in the process of being sent and approved by the whole Ethereum blockchain. This can happen during times of heavy network usage. In worst cases, this could take up to half an hour after you receive your confirmation email. Engrave your love in the blockchain.